Read why Vermintide was our favorite game at PAX, featuring more exclusive footage. One of the gems at PAX this year is Warhammer: End Times - Vermintide, Fatshark's melee fantasy take on Left 4 Dead's co-op survival. Above, we talk with line producer Liam O'Neill about melee maneuvering, loot, and the Warhammer universe. 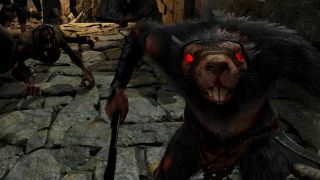 Within the interview is video we shot of us playing the game here at PAX, which included a look at some levels of Vermintide that were only shown to PC Gamer.